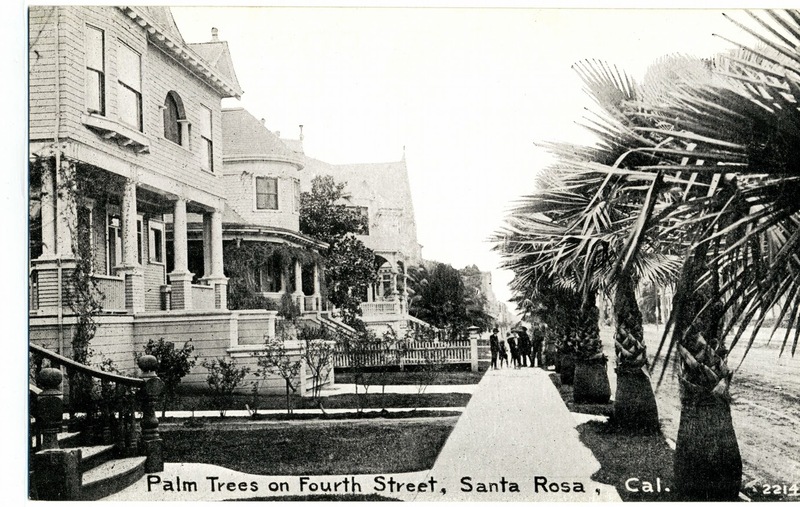 Before there was a "Redwood Highway" there was a proposal for a grand boulevard running the length of Sonoma County, both sides of the road lined with those damned palm trees. Such a plan was offered to the Board of Supervisors in 1911, and the Press Democrat reported the Supes were "charmed with [the] suggestion." No surprise, really; landscapers all over California in that era loved palm trees, despite the drawbacks of them sucking up enormous amounts of water and that they made swell homes for rats (try a Google search for "palm tree rats:" About 1,170,000 results). 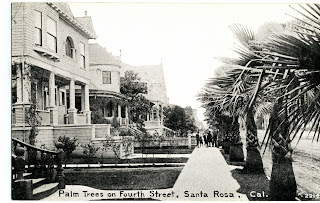 Like many places, Santa Rosa lined some streets with them, as seen here, and homeowners in the early 20th century often planted one or a few in their yards. You can still spot a survivor or three on probably every block in the older parts of town. These years around 1910 witnessed a swift and amazing leap into the modern world for Sonoma County. There were opportunities to watch hometown aviator Fred J. Wiseman and his associates fling themselves into the air, risking death in frequent crashes. Downtown Santa Rosa suddenly came alive with three (sometimes four) movie theaters and vaudeville houses. The Russian River resorts became the Bay Area hotspot after electricity came to the region and new trains made it easier to reach from San Francisco. And with one of those newly-affordable automobiles, anyone anywhere in the county could participate in these new adventures. Autos themselves were both familiar and foreign; for example, there was still no convention on what to call the owner of the machine. Prior to 1908 anyone behind the steering wheel was called a "chauffeur" in the Press Democrat but in the 1911 article transcribed below the paper can be found experimenting with "automobilists" and "autoists." While the state was preparing to spend an empire's fortune building those highway-things there was no driver's license exam to show an automobilist knew how to operate the vehicles using it. In a hilarious item below, the PD reported on its front page that 20 year-old Hilliard Comstock had purchased one of the finest handmade cars available in 1911 and drove it all the way back to Santa Rosa from Sausalito in high gear, apparently not knowing how to use a gearshift. "Although Mr. Comstock had had no previous experience in handling an automobile, he brought his new car up from San Francisco without difficulty and without assistance," the paper noted kindly, "as the machine can be throttled down to four or five miles an hour without shifting the gears." ...The Association placed itself squarely on record in the matter urging respect for all law and letting it be clearly understood that it does not stand for protecting the auto owner any more than for the protection of other people walking or driving along the highways, recognizing that each have equal rights. While many autoists do recognize these rights there are others who bring odium on the whole body by their disregard of the laws. This was the final Association meeting with James Wyatt Oates as president, ending his two years of leadership. 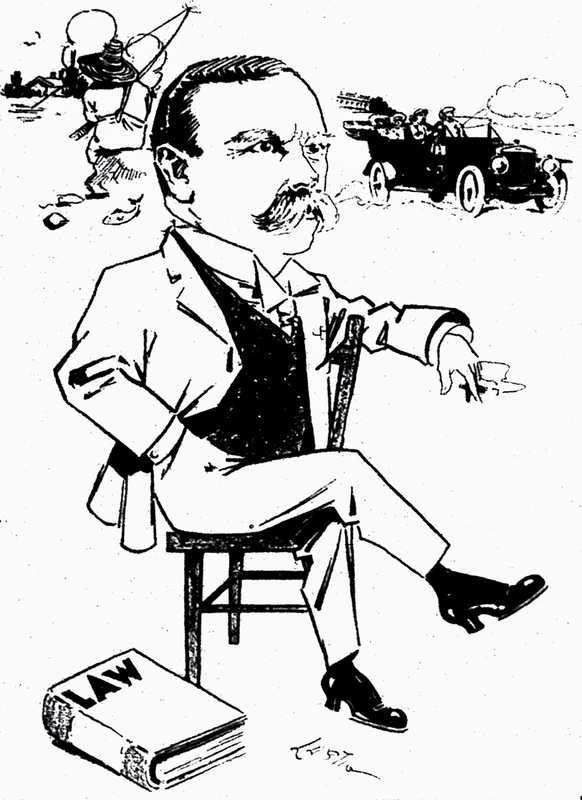 His retirement was announced with a cartoon in the Press Democrat shown here. In his hand is the ever-present cigar; his beady eyes glinted with the piercing gaze seen in all three known portraits. The cartoon is decorated with stock thumbnails of fishing and recreational motoring (both actual passions of Oates) but note in particular his "elevator" shoes. From the 1892 voter registration records we learn his distinguishing features were a scar on the left side of his head and that he was exactly five feet, seven and five-eights inches tall - the only voter to specify his height with such exact precision. As his shaving mirror in Comstock House seems designed for a person of somewhat shorter stature, we can presume he reached that particular altitude only with the boost of those remarkable heels. *Voters in 1910 approved the State Highways Act with blind faith that a highway system could be built and would bring progress (and maybe palm trees). They also believed those roads would be coming, pronto. Alas, much to the frustration of Sonoma County boosters and dreamers of boulevards, it would be 1913 before Sonoma County saw its first few miles of highway construction and it would be over a dozen years more before the North Coast's patchwork of old stagecoach turnpikes were improved and linked to become the Redwood Highway ("Redwood Empire" was coined in 1925, both springing from a regional civic association). An endeavor was made Wednesday to interest members of the Board of Supervisors in a scheme to make the ride through Sonoma county, from the Marin to the Mendocino line, additionally attractive by the planting of date palms on either side of the county road at proper distances apart. Mr. Lawrence, a landscape gardener, talked over the matter with individual members of the board, and his description of the pleasure such a boulevard would be quite fascinating. In other sections of the state Arbor Leagues have been formed and are being formed to plant shade trees along the county roads and something very picturesque has resulted. It is understood that the palms and the planting, etc., would probably cost $5,000, if the Supervisors should carry out the suggestions made by Mr. Lawrence. Hillyard [sic] Comstock has purchased a handsome 1911 fore-door [sic] Kine touring car, similar to the one on exhibition at the Press Democrat office. It is a classy machine, and attracts much attention. In every respect Mr. Comstock's beautiful car is a duplicate of the one to be given away by the Press Democrat on May 20 to the most popular lady contestant, and he is a beauty and runs like a top. Although Mr. Comstock had had no previous experience in handling an automobile, he brought his new car up from San Francisco without difficulty and without assistance. He did not find it necessary to shift his gears once on the trip, but made the entire distance from Sausalito to this city on the "high." The construction and ease of control make this entirely feasible with the Kline, as the machine can be throttled down to four or five miles an hour without shifting the gears. Colonel James W. Oates and Shirley D. Burris went to San Francisco on the morning train Friday, and they returned to this city in a pretty Hupmobile, which has been purchased by Colonel Oates from the Santa Rosa garage. Colonel Oates will use this machine for short trips and personal pleasure for himself and Mrs. Oates, and with his large machine will entertain their friends with delightful trips about the country. The Hup is a royal blue, for two passengers only, is fully equipped and has twenty horse power engines. It is capable of splendid speed and will make a nice roadster for Colonel Oates. In the beautiful sunshine of a June day over two hundred people members of the Sonoma County Automobile Association and friends and many others gathered amid all the picturesqueness of the Knights Valley Ranch formerly owned by the late Calvin H. Holmes and now the property of his heirs, the site most favored for the location of the new State Trades and Training School, to enjoy the annual outing and picnic of the Association on Sunday. The day was ideal for such an event, and into its pleasures all entered with zest. The shady trees, the waterfalls, the vineyards, the valley and mountain scenery and the other delights of the open air at this time of the year, lent much attraction to the outing. Well filled luncheon baskets were brought by the automobilists, and the contents enjoyed at noon in one of the loveliest spots imaginable. An additional attraction was the presence and music by the Healdsburg band, accompanying the large delegation from that city and sections. All part of Sonoma county were represented and the entire outing, unmarred by any accident, was voted a splendid success. His Excellency Governor Hiram W. Johnson was invited to be present, but many engagements following his southern trip prevented his acceptance of the courtesy. He sent a neat acknowledgement of the invitation. ...The by-laws were amended so as to make women eligible for membership in the Association. This was a wise move as there are scores of enthusiastic women automobilists in Sonoma County who are deeply interesting in the aims of such an organization...The Association also passed resolutions upholding the laws and ordinances against "speed burning..."